A little midweek motivation for ya. 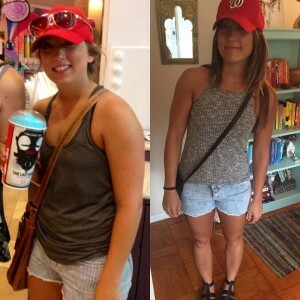 July 2014 vs July 2015. I’ve had two vacations in the past 2 months. So all the momentum I had built up felt like it came to a halt. And it’s been extremely hard to get myself back into a routine. So on Monday I told myself okay, I’m gonna own this week. And honestly I was totally scared. Everything felt extra heavy. And extra challenging. I felt like I lost everything I’ve worked so hard for. But then I decided to compare pictures. A year ago in DC to this past vacation in DC. So instead of getting down on myself I decided to look at the bigger picture. I have completely changed the past year. And I will continue to change. And life is all about balance. Coming back from vacation is always always always going to be hard. But you just have to find that motivation and get inspired. And I feel great. Studio fitness has been buzzin this week and to see all the hard work people are putting in is so so so inspiring. People have been killin it this week. So thankful for my Studio Fitness family for helping me get my motivation back! Just remember a set back isn’t a bad thing. Pull yourself out of it and keep going!